Hainan (Chinese: 海南; pinyin: Hǎinán ▶) is the smallest province of the People's Republic of China, located off the southern coast of the country. It consists of several islands, the largest of which is also called Hainan Island (Hainan Dao). When speaking of "Hainan" in Chinese, it is usually the main Hainan Island that is referred to. The province is closest in proximity to Guangxi autonomous region and Guangdong province to the north, and the port cities of Hong Kong and Macau to the northeast. Hainan island was called the Pearl Cliffs (珠崖 Zhūyá), Fine Jade Cliffs (瓊崖 Qióngyá), and the Fine Jade Land (瓊州 Qióngzhōu). The latter two gave rise to the province's abbreviation, Qióng (琼 in Simplified Chinese), referring to the greenery cover on the island. The People's Republic of China government claims Hainan's territories to extend to the southern Spratly Islands, Paracel Islands and other disputed marine territories. In addition, Hainan is also known as the largest Special Economic Zone laid out by Chinese leader Deng Xiaoping after the economic reforms of the late 1970s. The province has long been considered a place of exile rather than immigration by Chinese. Hainan served as an exile island for dissent government officials who had not warranted execution. The natural beauty and remoteness of the island has been providing a means for economic development. First, Hainan has become a popular tourist destination with beautiful beaches and mountains. Secondly, the Chinese government selected Hainan as its main space launch site. That could provide the island province with impetus to develop knowledge age industries, permitting a bypass of heavy manufacturing industries and focus on clean industries suited to the natural environment. Hainan first entered written Chinese history in 110 B.C.E., when the Han Dynasty established a military garrison there. Settlement by mainlanders proved slow however, and from early on Chinese considered the island fit only for exiles. During that period the Li people arrived from Guangxi and displaced the island's aboriginal Austronesian-speaking peoples. In the Wu Kingdom of the Three Kingdoms period, Hainan belonged to the Zhuya Commandery (珠崖郡). Under the Song Dynasty, Hainan came under the control of Guangxi Province, and for the first time large numbers of Han Chinese arrived, settling mostly in the north. Under the Yuan Dynasty (1206-1368), it became an independent province, but was made into part of Guangdong during the Ming Dynasty in 1370. In the sixteenth and seventeenth centuries, large numbers of Han from Fujian and Guangdong began migrating to Hainan, pushing the Li into the highlands in the southern half of the island. In the eighteenth century, the Li rebelled against the government, which responded by bringing in mercenaries from the Miao regions of Guizhou. Many of the Miao settled on the island and their descendants continue to live in the western highlands to this day. Hainan has historically been considered part of Guangdong and Guangxi, but became the Ch'iung-yai or Qiongya Circuit (瓊崖道) in 1912 upon the establishment of the Republic of China. In 1921, it was planned to become a Special Administrative Region (瓊崖特別行政區), and in 1944, it became Hainan Special Administrative Region with 16 counties, including many of the South China Sea islands. During the 1920s and 1930s, Hainan was a hotbed of Communist activity, especially after a bloody crackdown in Shanghai in 1927 drove many Communists into hiding. The Communists and the Li natives fought a vigorous guerrilla campaign against Japanese occupation from 1939-1945, but in retaliation, over one third of the male population of both groups were killed by the Japanese. Feng Baiju led the Hainan Independent Column of fighters throughout the 1930s and 1940s. After the Japanese surrender in 1945, the Nationalist Party (KMT) re-established control over the island. It was one of the last areas of China to be controlled by the Republic of China. However, from March to May 1950, the Landing Operation on Hainan Island (Chinese: 海南島登陸戰役; Pinyin: Hǎinándǎo Dēnglù Zhànyì) captured the area for the CCP. Feng Baiju and his Column of guerrilla fighters played an essential role in scouting for the landing operation and coordinated their own offensive from their jungle bases on the island. This allowed the Hainan takeover to be successful where the Jinmen and Dengbu assaults had failed in the previous fall. The takeover was made possible by the presence of a local guerrilla force that was lacking on Jinmen, Dengbu, and Taiwan. Hence, while many observers of the Chinese civil war thought that the fall of Hainan to the Communists would be followed shortly by the fall of Taiwan, the lack of any Communist guerrilla force on Taiwan and its sheer distance from the mainland made this impossible, as did the arrival of the Unites States seventh fleet in the Taiwan Strait after the outbreak of the Korean War in June of 1950. On May 1, 1950, under the People's Republic of China, the Hainan Special Administrative Region became an Administrative Region Office (海南行政区公署), which basically made it into a branch of the Guangdong provincial government. On October 1, 1984, it became the Hainan Administrative Region (海南行政区), with a People's Government, and finally became a province separate from Guangdong four years later. After they had established control over the island, the Communists resumed economic development more or less along the same lines established by the Japanese, but the results were limited by the island's isolation, its humid and typhoon-prone climate, and its continuing reputation as a place of danger and exile by mainland Chinese. In 1988, when the island was made into a separate province, it was also designated as a Special Economic Zone, in an effort to increase investment and subsequently boost the provincial economy. Hainan, separated by the Qiongzhou Strait (瓊州海峽) from the Leizhou Peninsula (雷州半島) of Guangdong, is the largest island administered by the People's Republic of China. 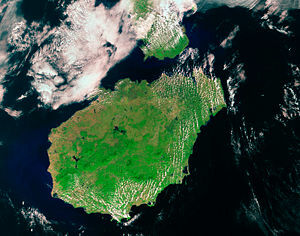 The PRC however, regard it as the second largest island, since Taiwan is considered the largest. To the west of Hainan is the Gulf of Tonkin. Wuzhi Mountain, at an elevation of 1,876m, is the highest point on the island. Most of the rivers in Hainan originate in its central area and flow radially in different directions. The Nandu River in the northern part of the island is 314km long, and its tributary, the Xinwu River, is 109km long, while the Changhua River in the west is 230km long, and the Wanquan River in the east is 162km long. Evaporation during the dry season around the coastal areas greatly reduces the flow of these rivers. There are very few natural lakes in Hainan. There is a well-known artificial reservoir, the Songtao Reservoir, in the central-north area. Hainan has a tropical moist monsoonal climate. Its annual temperature change is less than 15 degrees Celsius. The coldest months are January and February when the temperatures drop to 16 to 21 degrees Celsius, and the hottest months are July and August, when the temperatures are 25 to 29 degrees Celsius. Except for the mountainous regions in the central part of the island, the daily average temperature in Hainan is above 10 degrees Celsius. The summer in the north is swelteringly hot and, for more than 20 days in a year, the temperature can be higher than 35 degrees Celsius. The average annual precipitation is 1500 to 2000 mm and can be as high as 2400mm in central and eastern areas, and as low as 900mm in the coastal areas of the southwest. The eastern part of Hainan lies in the path of typhoons, and 70 percent of the annual precipitation is derived from typhoons and the summer rainy season. Major flooding occurs due to typhoons and that can cause many problems for the local residents. In the official PRC territorial claim, Hainan Province includes not just one island, but also some two hundred South China Sea Islands. The containment of the South China Sea Islands provides Hainan with a very large water body, but disproportionately small land area. James Shoal island (曾母暗沙 Zengmu Ansha), which is presently marked by the People's Republic of China, signifies the country's southernmost border, but the Malaysians also claim it as part of their continental territory. Hainan's system of administrative division differs from the other provinces of China. Most of the other provinces are divided entirely into prefecture-level divisions, which are then further divided into county-level divisions. The county-level divisions generally do not come directly under the province. 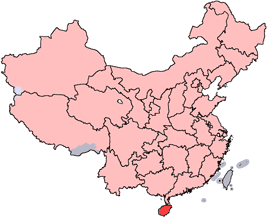 In Hainan however, nearly all county-level divisions (except for its four districts) come directly under the province. This method of division is due to Hainan's relatively sparse population. Those cities and counties are in turn divided into 218 township-level divisions (20 towns, 181 townships, and 17 subdistricts). Since the 1980s, Hainan province has been a Special Economic Zone of China. Prior to this, the province had a reputation for being a "Wild West" area, largely untouched by industrialization. Even today, there are relatively few factories in the province. In terms of agriculture, the province has developed a small economy, which is comprised mainly of natural rubber, seed breeding, vegetables, tropical fruits, tropical flowers and plants, and marine aquaculture. Major tropical crops with large growing areas and high economic value include coconuts, oil palm, betel palm, pepper, sisal hemp, lemon grass, cashews, and cocoa. Currently, 3.152 million hectares of land in Hainan have been cultivated, while 260,000 hectares remain untouched, around 90 percent of which are potential farming lands. Hainan has an abundant mineral resources pool. Over 10 varieties of superior minerals hold a very important position in China’s mining industry, including glass-quality quartz sand, natural gas, titanium, zircon, sapphire, crystal, oil shale and zeolite. The reserves of iron ore account for roughly 70 percent of the country’s high-grade iron ore reserves. The reserves of titanium and zircon make up 70 and 60 percent of the country’s totals respectively. In addition, gold, granite and mineral water are of significant developmental value for the province. In addition, a basic industrial system is beginning to take shape in the province, focusing on natural gas, chemicals, building materials, beverages, food, medicine, chemical fibers, textiles, machinery, electronics, metallurgy, and several other industries. While this nascent industrial economy grows, tourism will continue to play an important part of Hainan's economy, largely because of its relatively untouched tropical beaches and lush forests. Its nominal GDP for 2006 was 105.24 billion yuan (US$13.6 billion), making it the fourth smallest in all of the People's Republic of China, contributing a minuscule 0.5 percent to the entire country's economy. Its GDP per capita was 12,650 yuan (US$1,640). One of the major satellite launch centers of China is located in Hainan near the city of Wenchang. It is called Wenchang Satellite Launch Center and is the launch center closest to the equator. Along with this one, China announced in October of 2007 that it would build its fourth space launch center, just a week after it fired off its first lunar orbiter. The new launch center, to be built on the southern end of Hainan, is scheduled to be completed in 2012 and start operating in 2013. The location of the launch center in Hainan, a low-latitude region, will displace more than 6,000 residents. These individuals will be forced to relocate, in order to make way for the space center, which will occupy 1,200 hectares. The site will be mainly used for launching various kinds of satellites and large space stations, and the plan has been approved by the government. A 407-hectare space themed park will also be constructed near the new launch center. In 2000, the ethnic groups of Hainan included the Han Chinese, known as the Hainanese, who currently make up a majority (84 percent of the population). In addition, minority groups include the Li people (14.7 percent of the population), the Miao (Hmong) (0.7 percent) and the Zhuang (0.6 percent). The Li are the largest indigenous group on the island in terms of population. Also found on the island are the Utsuls, descendants of Cham refugees, who are classified as Hui by the Chinese government. In terms of religion, Hainan is quite diverse, as there are 90,000 Buddhist Hainanese, and 6,500 Muslims. Most, if not all, of the Muslims are Utusls living near Sanya. Because Hainan was a point in the travel route of missionaries, there are also many Christians, including 35,000 Protestants and 4,100 Catholics. According to statistics from the end of 2000, there were 5 higher education institutions in Hainan, with 18,504 students enrolled and and 1,571 teachers. In addition, there were 88 specialized secondary schools with 44,127 students and 3,145 teachers, and 503 secondary schools with 435,789 students and 1,354 teachers. At the primary school level, there were 4,167 schools with 156,735 students and 50,339 teachers. The enrollment rate of school-age children was 99.71 percent. The Han Chinese of Hainan speak a variant of the Min Nan Chinese language, known as Hainanese. In addition, the national standard Putonghua is understood and spoken by most people, and Standard Cantonese is understood by many local Hainanese. English is understood by some of the younger generation, but Hainan still largely remains a non-English speaking environment. The Li people have their own language, as do the Miao and Zhuang. The latter three groups would usually speak Standard Mandarin as a second language. Hainan cuisine is said to be "lighter, with mild seasonings." A variety of local tastes and flavors are mixed in with the Han Chinese flavors, creating a unique variation. As would be expected from an island, seafood predominates the menu, as shrimp, crab, fish, and other sea-life are widely available. Hainan chicken rice, a famous dish in Southeast Asia bearing the region's name, can be found on the island though it is not as popular there as its fame would suggest. As Hainan Island is not heavily industrialized, its greenery, together with its beautiful beaches and clean air make it a popular tourist attraction. The island is accessible through ferry links with Guangdong, as well as a variety of air links provided by the two main airports, Meilan Airport in Haikou, and Phoenix Airport in Sanya. In December 2004, the Guangdong-Hainan passenger railway link opened, connecting Guangzhou in Guangdong province directly to Hainan island. The complete trip, which includes crossing the Qiongzhou Strait by ferry, takes a total of 12 hours. The project cost $583 million United States and is expected to greatly enhance Hainan's tourism and economic development. This is important because Hainan currently lags well behind Shenzhen and Zhuhai special economic zones, which border Hong Kong and Macau, respectively. Hainan Island is often divided into eight regions for tourism purposes: the Haikou area (Haikou, Qiongshan, Ding'an), the Northeast (Wenchang), the Central East Coast (Qionghai, Ding'an), the South East Coast, the South (Sanya), the West Coast (Ledong, Dongfang, Changilang), the North West (Danzhou, Lingao, Chengmai), and the Central Highlands (Baisha, Qiongzhong, and Wuzhishan/Tongzha). 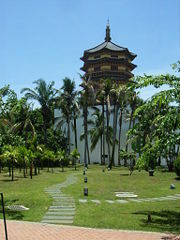 Haikou is the province's capital and contains interesting historic sites. Also known as Coconut City, Haikou is a major port. Xiuying Fort Barbette was built in 1891 to defend the southeastern corner of China during the Sino-French War. The Xiuying Fort Barbette covers about a third of an acre. Its five large cannons are still intact and viewable at the site. Hairui Tomb is a key national cultural protection site. Hai Rui was a compassionate and popular official of Hainanese origins who lived during the Ming Dynasty. He was famous for his lifelong honesty and his willingness to speak out on behalf of local people. In later life, Hai Rui was persecuted and fell out of favour with the emperor. His admirers built the Hai Rui Tomb after his death to commemorate his great works. Construction of the tomb began in 1589. Perhaps the best known tourist attractions of Hainan Island are its world class beaches, luxurious hot springs, and beautiful scenery. With white sand beaches, tranquil green waters and areas of lush vegetation, Hainan has much to offer. Some top scenic sites are Yalong bay National Resort, Dadonghai Tourist Resort, Qizhi Shan (Seven Finger Mountain), Guantang Hot Spring Resort, Shishan Volcanic Garden; Wanquan River, Baishi Ridge Scenic Zone and Baihua Ridge. The province has initiated a visa-upon-arrival policy for foreign tourist groups from 21 countries in 2000, in order to attract visitors. It received 380,000 overseas tourists in 2002. This page was last modified on 25 July 2017, at 21:07.